On the evening of November 1, 2011, in spite of the early winter chill in London, a warm light spilled out from the Chinese Embassy. 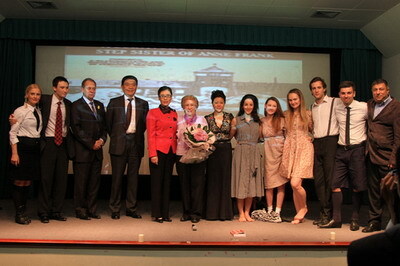 Here nearly a hundred people, including the guests from all walks of life in the UK, representatives of China-funded institutions, Chinese community leaders, Chinese diplomats and their families, gathered to watch the drama"And Then They Came For Me: Remembering the World of Anne Frank", which is adapted from the personal experience of Ms. Eva Schloss, an Auschwitz survivor. This is the first event jointly hosted by the Chinese Embassy and the 48 Group Club Women Icebreakers after Ambassadress Madame Hu Pinghua became Honorary Sponsor of the organization this June. 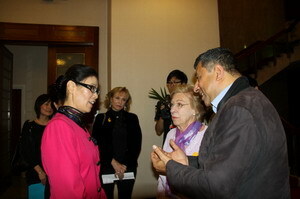 When Ms. Eva Schloss, the prototype of the character in the drama, came to the scene, she received an enthusiastic greeting from Madame Hu Pinghua. Ms. Schloss, now 81 years old, looked bright and kind. 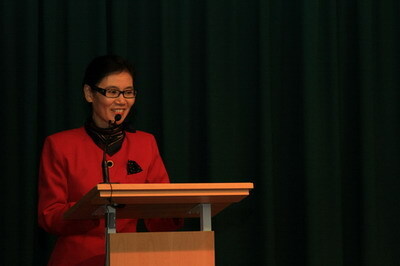 She warmly greeted the participants, bringing a warm and friendly atmosphere to the entire hall. 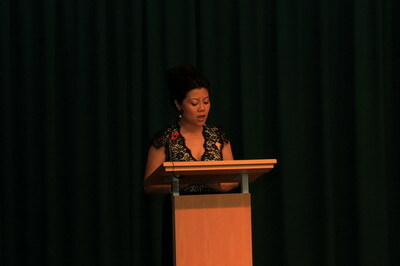 Before the performance, Ms. Lillian Davies, Chair of the 48 Group Club Women Icebreakers, first delivered a speech. She thanked Madame Hu Pinghua and the Chinese Embassy for their active support in this event of special significance, and she pointed out that a world of peace and mutual love is the common aspiration of people of all different races, nationalities and faiths. Ms. Davies hoped that the participants would call for a more inclusive and better society through common belief and joint actions. Madame Hu Pinghua warmly welcomed Ms. Eva Schloss, the performance team and all the guests on behalf of Ambassador Liu Xiaoming and the Chinese Embassy Women's Group. She thanked Eva for writing a book with her own personal experience, thus allowing us to review the history. Madame Hu said that the drama describes an unforgettable journey in human history, shows the glory and hope of humanity and highlights what peace, love and life is all about. During World War II, when Jews were slaughtered in Nazi Germany, China opened its arms to Jewish refugees and helped resettle many of them without any conditions. Over 30,000 of Jewish refugees came to Shanghai. That's more than all the Jews going to Canada, Australia, New Zealand, South Africa and India combined. Madame Hu said that at the same time when Jews were slaughtered in Europe, the Chinese people were also suffering heavily from invasion by Japan. The invaders seized our land and enslaved and killed the Chinese people, including the Nanjing Massacre, which took over 300,000 lives. To win freedom and independence, the Chinese nation fought fascism side by side with all the peace-loving nations around the world, and finally won the victory after eight years of tough resistance at the cost of 35 million casualties. Madame Hu pointed out that although the stories of Annes and Evas have now become history, they have retained their timeless and universal appeal. Today, over 60 years after the war, peace, development and cooperation have become the call of our time. However, our world is still far from stable. It is crying out for understanding, trust and love. 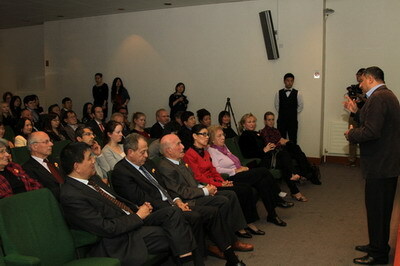 In closing, Madame Hu expressed the hope that the drama would be a unique experience to learn lessons from history and build a shared future. Mr. Nic Careem, Director of the drama, briefed the audience on the story line. 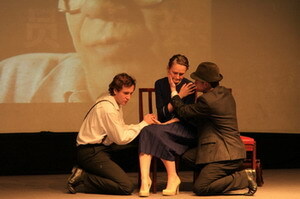 The drama reproduces the suffering of Eva and her family under the reign of Nazi regime in a form combining stage performance and multimedia. Since its premiere in 1996, the drama has been played at the parliaments and schools in all European countries. It has become an important performance on the International Holocaust Remembrance Day each year and has received extensive attention from the media in various countries and recognition from many governments. 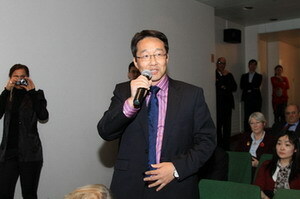 The drama will be staged at the United Nations in New York on November 16, 2011. The heavy story and the skilled performance combined to vividly present the miserable history to all the audience and inspired their reflections on the human nature and desire for peace. 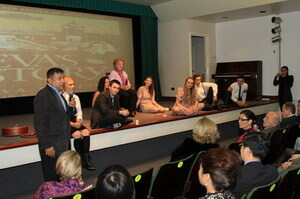 After the performance, Ms. Schloss and Director Careem held a Q&A session with the audience. Eva said that everyone would encounter difficulties in his life. What we need is not complaint and resentment but a positive attitude, tolerance and love. She especially gave advises to the young people and encouraged them to face squarely the difficulties and setbacks in their life with an optimistic and positive spirit. Director Careem said that when he watched the drama on occasion several years ago, he was deeply touched and felt obliged to tell this story to more people and to spread the message of opposing wars and seeking peace to all around the world. 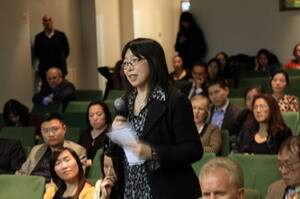 The in-depth and candid Q & A received sympathetic response and warm applause from the audience. Mr. Stephen Perry, Chairman of 48 Group Club, said in his speech that in the last century, many innocent people suffered brutal racist persecution. China was also subjected to aggression and suffering. We can avoid repeating the history only by remembering it. Eva's story is a microcosm of all those that were persecuted. Today, it is of endless significance that we can know and understand history in such an international environment. The 48 Group's purpose is to strive for practicing the Icebreaker's mission and to build a bridge of friendship, understanding and trust between the young people. This bridge is the best way for peace. The 48 Group Club Women Icebreakers was founded on June 30, 2011 as an organization aiming at developing a better platform for communication, enhancing the mutual understanding and mutual benefit between China and the UK with women's spirit of tolerance, understanding and cooperation, and promoting the China-UK economic, trade and cultural exchanges. 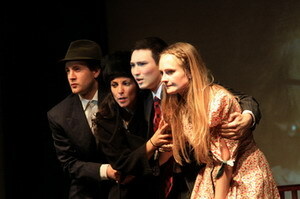 The drama "And Then They Came For Me: Remembering the World of Anne Frank" is adapted from the autobiographical novel "Eva's Story" of Eva Schloss, an Auschwitz survivor. Eva's mother married to the Anne, the author of "The Diary of a Young Girl". 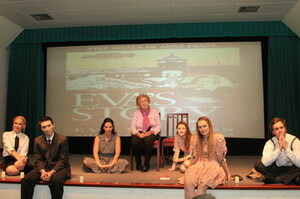 With the help of her step father, Eva overcame the hatred in her heart and published the autobiographical novel 'Eva's Story' in 1988 to tell her experience in the concentration camp. Since its premiere in 1996, the drama has been performed nearly a hundred times around the world and has become an important program on the International Holocaust Remembrance Day every year.